— Markel Co-CEO Tom Gayner, Q3 2016 conference call on November 2. As the saying goes, imitation is the sincerest form of flattery. Berkshire Hathaway’s unique story over the past half century has attracted many who claim to be replicating Warren Buffett’s playbook but, in most cases, these imitators have focused more on style than on substance. In the case of Markel, it is starting to become more clear that management has focused much more on the substance of Berkshire’s business model compared to the “stylistic” imitators. At the core of Berkshire’s business model is a well run collection of insurance operations and the same is true for Markel. Markel has benefited from a well selected portfolio of marketable securities which is also a hallmark of the Berkshire model. Perhaps most importantly, since 2005 Markel has attempted to replicate Berkshire’s pattern of acquiring non-insurance businesses. Markel Ventures has grown rapidly over the past decade and now deserves more attention from shareholders and analysts, as we discussed in greater detail earlier this year. Markel’s overall results and intrinsic value are still driven primarily by the results of the insurance business and this will remain the case for many years to come. However, the collection of businesses in the Ventures group now have a meaningful impact on reported results and the intrinsic value of this group can no longer be ignored by analysts. It is worth taking a brief look at the progress of Markel Ventures over the first nine months of 2016. Markel Ventures operating revenues grew to $906 million in the first nine months of 2016, representing an increase of 15 percent. The main driver for the increase was the acquisition of CapTech in December 2015 along with higher sales volume in a transportation-related business. The exhibit below shows the Ventures income statement since 2011. 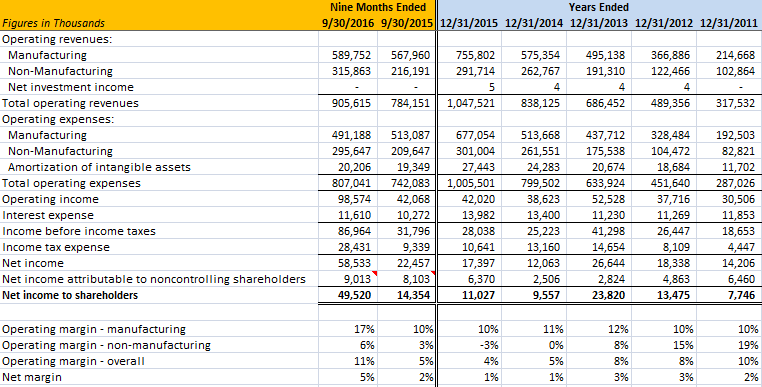 Since Markel does not provide a full income statement presentation for Ventures in the 10-Q, the presentation for the first nine months of 2015 and 2016 is derived/estimated from other disclosures and may be somewhat off, but does show the trends from a directional perspective. In the exhibit, net income attributable to non-controlling shareholders is estimated and could be somewhat off. The revenue, operating expense, amortization, interest expense, and income tax expense figures are taken directly from the 10-Q. One of the factors that has distorted results in both 2015 and 2016 involves changes in contingent consideration associated with acquisitions. Contingent consideration, often referred to as earn-outs, is paid to selling shareholders of companies that Markel acquires and is based on the results of the business in periods following the acquisition. This practice is intended to ensure that sellers continue to have an incentive to perform well post-acquisition. During the first nine months of 2015, Markel recorded a $26.6 million increase in earn-outs associated with the Cottrell acquisition. During the first nine months of 2016, Markel recorded a $10.3 million increase in earn-outs associated with the CapTech acquisition. Cottrell is included in the manufacturing group while CapTech is included in the non-manufacturing group. We can see that the operating margin in the manufacturing group rose from 10 percent to 17 percent but a significant portion of this increase is due to the fact that the Cottrell earn-out adjustment recorded in 2015 did not recur in 2016. The increase in the operating margin for the non-manufacturing group would be even greater if not for the earn-out adjustment at CapTech. Here we also note the improvement in EBITDA margins over the first nine months of 2016 compared to the prior year. It should be noted that the earn-out adjustments impacted the EBITDA margins for both 2015 and 2016 for the same reasons discussed above. Continuing the practice that was put forward earlier this year, we attempt to estimate the “economic earnings” for the Markel Ventures group, keeping in mind that both EBITDA and net income have significant flaws (see article from May 2016 for details on the rationale behind this statement). The exhibit below uses net income as a starting point and makes several adjustments intended to arrive at a better estimate of economic earnings. The most important adjustments involve adding back the increase in contingent consideration, which we believe should more accurately be thought of as a cost of the acquisition (a capital investment) rather than a periodic operating expense, as well as the majority of amortization expense. These items are adjusted for tax effects and added to reported net income to arrive at an estimate of economic earnings. To arrive at economic earnings as a percentage of equity for the first nine months of 2016, we annualize economic earnings and divide it by starting equity as of December 31, 2015 because we do not have Markel Ventures balance sheet data as of September 30, 2016. Despite the need for certain estimates and adjustments, it is quite clear that results have meaningfully improved in 2016. With economic earnings of over $80 million on an annualized basis, one can infer that Ventures can easily justify over 10 percent of Markel’s overall market capitalization. For many decades, Berkshire Hathaway had a competitive advantage when it came to buying well run family controlled private businesses. The competitive advantage was due in large part to Warren Buffett’s promise to allow these businesses to retain operational autonomy post-acquisition. In some cases, Berkshire was the only acceptable buyer for families who needed liquidity but cared about the future of their business more than extracting the last dollar in an auction. Berkshire has reached the size where acquiring most family run businesses would not have a material impact on its results. However, it is certain that many families still seek what Berkshire had to offer. Markel is obviously trying to capitalize on this by representing itself as a home for private businesses that wish to continue operating on a relatively autonomous basis. Just to expand on the comments, we see some fascinating stuff just like we have a diverse and eclectic set of insurance risk that we underwrite, we have a diverse and eclectic set of businesses that are part of Markel Ventures. And the very, very, very good news is that now that we have a decade-long track record of buying, integrating and successfully partnering with people who run these businesses, word gets out. And as the old Breck shampoo commercial used to say, they told two friends – he told two friends and they told two friends. So we see some cool stuff. At the moment, it’s a sellers’ market. … The beautiful thing about Markel is just, as we are disciplined on underwriting, we’re disciplined on buying a stock, buying a bond, buying a Markel Ventures business so we can build up capital, we can look at our own shares. We have a 360 degree view of where and how to allocate capital. And let me emphasize the fact that while it’s out of style these days and it’s the most contrarian thing you could do, when Anne [CFO] says we have $2 billion of liquidity at the holding company. There may come a day when that would really come in handy, and who knows where that will be, but we will stand in a small crowd when that day comes, periodically we’ve done that from time to time, and that is a core component of the way we think. Mr. Gayner also stated that prices for businesses are elevated due to the current seller’s market and that Markel intends to remain disciplined. In light of this, we can infer that Markel’s practice of maintaining significant liquidity is more likely to result in acquisitions during a future bear market coupled with negative sentiment among sellers. We could still see some deals in the near term but it is probably best to not expect much to happen very soon. It isn’t likely that any company will be able to fully replicate the results associated with Berkshire Hathaway’s business model but it is surprising that relatively few have even made the attempt. 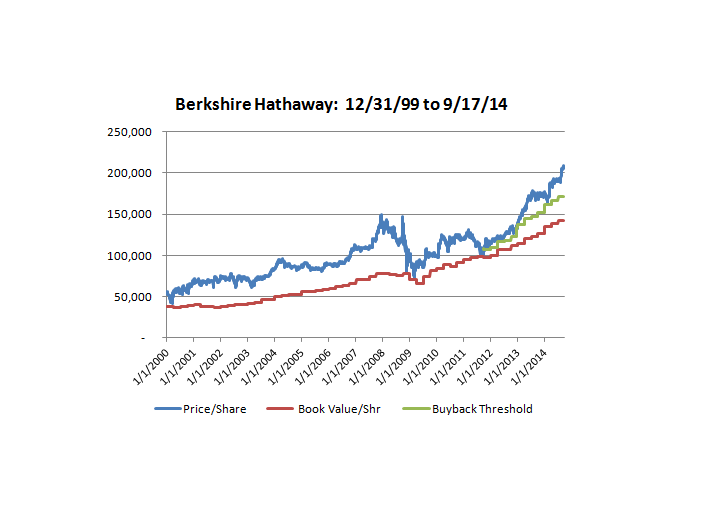 Over the past decade, Markel has taken obvious steps to imitate Berkshire’s business model. For many years, this attempt did not appear to be bearing much fruit, at least in terms of reported results, but that now appears to be changing especially if one looks past the distortions caused by the accounting for contingent consideration discussed above. History may not repeat but it clearly seems to rhyme. Ten years from now, we should have a very clear idea of the degree to which Markel’s story rhymes with Berkshire. A full replication of Berkshire’s unique history is not necessary to provide attractive returns for Markel shareholders. Disclosure: Individuals associated with The Rational Walk LLC own shares of Markel Corporation and Berkshire Hathaway.